Arklow Geraldines Ballymoney ladies were busy in championship action on Saturday July 12th with the Junior Ladies taking on Carnew at home and the seniors away to Baltinglass. The junior ladies, following on their defeat of Newtown the previous weekend, made a very strong start scoring two unanswered goals in the opening ten minutes. The forwards were at full tilt with Chloe O’Reilly, Sarah Kendrick and Sarah Devlin making life very difficult for the hard-working Carnew back line. Róisín O’ Reilly and Doirrean O’Reilly came deep into midfield to collect ball for the attacking AGB forward line and Aisling Appleby, vice captain, played a leadership role in the absence of team captain Molly Byrne. At mid-field Michelle Scanlon brought all her experience to bear for the Arklow side and Claire Murray seemed to get stronger in the number 9 jersey as the game went on. Caoimhe Crowley was tasked with guarding Carnew’s Claire Turner and did a super job in containing this very able forward throughout the sixty minutes. Emer Curran and Kayleigh Earls were both stoic in defence for Arklow as Carnew maintained the pressure to the end of each half. Emily Mitchell intercepted crucial ball for AGB as she advanced purposefully from her half back position to turn the ball over at centre field, thwarting the Carnew attack on numerous occasions. Mairead Hurley and Aoife O’Reilly completed the Arklow back line and with a blend of youth and experience the AGB defence held firm throughout. Aoife was playing her first game at centre back in the absence of Ger Galvin and she carried the ball forward on several occasions connecting with her sister Róisín in the half forward line to turn defence into attack. This was a super all round performance for AGB with substitutes Becky Hayden, Lisa Keegan, Megan Boyle, Ellie Jones and Lucia O’Grady all contributing on the day. Other panel members Aoife Murphy and Fia O’Dwyer, along with the absent Ger Galvin, Mary Geraghty, Molly Byrne and Paula Maher, and the injured Orla Hayes ensure that the battle for places on this team is set to continue for the remainder of the championship campaign. AGB: Amy Devereux, Mairead Hurley, Kayleigh Earls, Emer Curran, Emily Mitchell, Aoife O’Reilly, Caoimhe Crowley, Michelle Scanlon, Claire Murray, Róisín O’Reilly (0-2), Chloe O’Reilly(1-2), Sarah Kendrick(3-2), Doirrean O’Reilly(1-3), Sarah Devlin(2-0), Aisling Appleby Subs: Ellie Jones, Lisa Keegan, Lucia O’Grady, Becky Hayden, Megan Boyle, Aoife Murphy, Fia O’Dwyer. The senior squad took on Baltinglass in Baltinglass, in the opening round of the championship for AGB and this game was played at a blistering pace by both sides. Baltinglass made the stronger start with two goals in the 7th and 9th minutes, both from the boot of Marie Kealy. Áine O’Reilly opened the account for AGB with a point in the 10th minute and Steph Martin added another in the 13th. Baltinglass’ Julie Fitzmaurice added a point for her side in the 16th minute and then a goal from Arklow’s Áine O’Reilly narrowed the deficit in the 17th minute. Another goal from Annie Conroy in the 18th gave Arklow a narrow lead. This was wiped out by a goal from Sinead Kelly for Baltinglass. Annie Conroy and Jessica Hurley added points for Arklow but Baltinglass also increased their tally coming up to half time leaving the half time score 2-4 to 3-7 in favour of the home side. Throughout the sixty minutes the Arklow back line soaked up relentless pressure from the marauding Baltinglass forwards and it has to be said without their sterling performances the margin at the end would have been very different. In the second half they forced seven consecutive kicks wide of the mark as they constantly harried the Baltinglass forwards. They held this storming Baltinglass forward line to four points for the half. AGB managed to forge ahead and chalk up 2-3 for the half, dramatically equalising in injury time. However, Baltinglass mid-fielder, Julie Fitzmaurice won possession from the final kick out of the game and broke through the Arklow defence to score the winning point for Baltinglass. The final score in this sporting encounter was 3-11 to 4-7 with Baltinglass winning by the narrowest of margins and leaving teams and spectators in no doubt that there will only ever be the kick of a ball between the top teams in this senior ladies championship. AGB: Linda Dempsey, Eimear O’Brien, Áine Byrne, Kirsty Hughes, Ciara Forde(1-0), Jessie McElheron, Katie Larkin, Ailbhe Carney, Sue Tyrrell, Niamh Arthur, Annie Conroy(1-1), Jessica Hurley(0-2), Steph Martin (0-1), Áine O’Reilly(2-3), Keelin Riley. Subs: Kayleigh Carter, Vicky O’Brien. 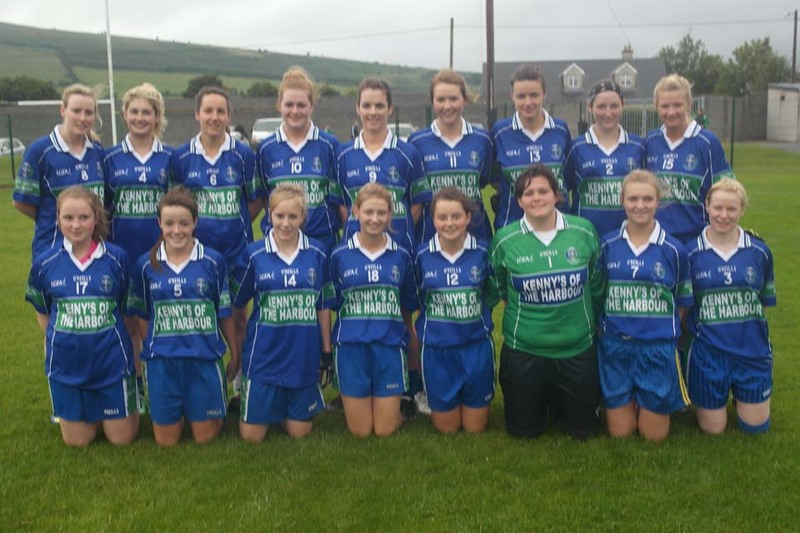 Baltinglass: Sinead Fisher, Paula Faulkner, Sarah-Jane Winder, Ann-Marie Doran, Ciara Hennessy, Lucy Cushe, Hannah Sheerin, Julie Fitzmaurice(0-2), Catherine Dempsey, Emma Byrne, Chloe Farrell(0-2), Helena Dowling, Susan Dowling, Sinead Kelly(1-4), Marie Kealy(2-3).